Popularlly known as the Suprstar worldwide, this man does not really have any background as family for having entered the Indian Film industry. But thanks to his wife and daughters, the entire family has been doing a lot in making sure they contribute a lot in the industry. 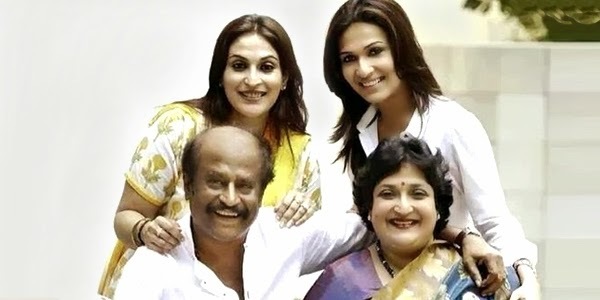 Rajini k nown for his style and the wonderful idea that 'nothing is impossible' in his movies fad is the father of two girls – Aishwarya and Soundarya. Although in this case , the father has been involced with acting, the daughters share a strong interest in the 'direction' field. Up recently, was the movie Kochadaiyaan that released in the father -daughter combo making heads of many turn although criticized for the bad implementation of the technology made available. But ofcourse being one of the young women director's, everyone knows Soundarya has a long way to go. Aishwarya on the other hand is also into direction but is not keenly invilved in animation and graphics but with 'real-action' movies. Her '3' was a famous one and was considered a hit amongst many. Something amazing to note here is that Rajini's extended family was also actiely involved in this project. Anirudh Ravichander contributed to the movie by making some good music and needless to say 'Why this kolaveri di?' captured the attention of all. Another interesting point to note her eis that Dhanush played the role of the lead actor in the movie, who happens to be Rajinikanth's son-in-law in real life. Thus the family in one way or the other has been active participants in the film industry. Not many know this but Latha Rajinikanth has also contributed by lending her voice for tracks. She is also actively involved with planning activities for the various Rajini fan clubs. This family, either considered in a nuclear or in an extended manner definitely falls under the category of 'immense' contribution. Raaga.com takes this opportunity to thank Rajini's family for their continued contribution in the Indian film industry.